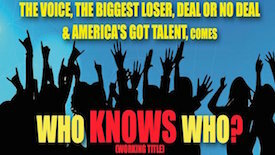 Heather Cruise sat down with the casting team for the new Prime Time Game Show, "Who Knows Who." ‘Who Knows Who’ is “rooted in an old ‘Friends’ episode,” Zack says. He’s talking about the apartment episode, “the guys and girls play each other to see who wins the apartment. So who knows who better?”Jonathan adds. The casting producers are looking for teams of "friends, family members, co-workers, you name it…and it’s ‘Who Knows Who’ better to win the cash prizes. And “the cash and prizes are substantial,” Zack adds. Watch the interview with 3 of the casting producers from the new Prime Time game show “Who Knows Who” to find out more about casting tips, how to apply and audition locations. Follow the link at the end to apply right now!